Richard Foreman, the author of the bestselling Raffles: The Gentleman Thief books, blends the political intrigue of Robert Harris’ series of Cicero novels with the action and adventure of Simon Scarrow in this sweeping historical epic. Augustus: Son of Rome tells the story of the assassination of Julius Caesar and the rise of his heir, Gaius Octavius, as he journeys to Rome from Apollonia. We see a boy grow into a man as Octavius develops the moral courage, intelligence and ruthlessness that will finally see him become Augustus, Emperor of Rome. The pen and sword will be employed to defeat his enemies and Octavius will earn the name of “Caesar”. Yet Rome will exact its price – and triumph will be accompanied by tragedy. Julius Caesar, Cicero, Cleopatra, Mark Antony, Brutus and Marcus Agrippa all feature in this epic adventure, which will appeal to fans of Shakespeare, Plutarch and Conn Iggulden alike. Richard Foreman is the author of the Raffles series of books and the historical novel A Hero of Our Time. He has worked as a literary consultant and publicist to a number of bestselling authors, including Tom Holland, Conn Iggulden and Simon Scarrow. He lives in London. 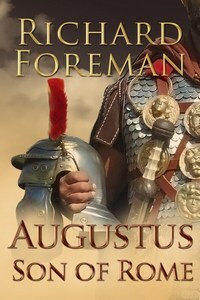 ‘Augustus: Son of Rome forges action and adventure with politics and philosophy. This superb story is drenched in both blood and wisdom – and puts Foreman on the map as the coming man of historical fiction’.